Mission Bend began in the early 1980s. The area gained population between 1980 and 1990. In 1990 the community had 24,945 residents. By 2000 many of the area's residents commuted to Houston. Mission Bend is located at 29°41′37″N 95°39′42″W﻿ / ﻿29.69361°N 95.66167°W﻿ / 29.69361; -95.66167 (29.693667, -95.661721). According to the United States Census Bureau, the CDP has a total area of 4.9 square miles (12.6 km2), of which 4.9 square miles (12.6 km2) is land and 0.039 square miles (0.1 km2), or 0.41%, is water. As of the census of 2000, there were 30,831 people, 8,978 households, and 7,864 families residing in the CDP. The population density was 5,900.1 people per square mile (2,276.1/km²). There were 9,202 housing units at an average density of 1,761.0/sq mi (679.3/km²). The racial makeup of the CDP was 46.32% White, 21.50% African American, 0.31% Native American, 16.96% Asian, 0.08% Pacific Islander, 10.63% from other races, and 4.20% from two or more races. Hispanic or Latino of any race were 27.06% of the population. There were 8,978 households out of which 55.7% had children under the age of 18 living with them, 70.5% were married couples living together, 12.5% had a female householder with no husband present, and 12.4% were non-families. 9.5% of all households were made up of individuals and 1.1% had someone living alone who was 65 years of age or older. The average household size was 3.43 and the average family size was 3.67. In the CDP, the population was spread out with 33.7% under the age of 18, 8.1% from 18 to 24, 32.9% from 25 to 44, 21.4% from 45 to 64, and 3.9% who were 65 years of age or older. The median age was 32 years. For every 100 females, there were 97.2 males. For every 100 females age 18 and over, there were 92.2 males. The median income for a household in the CDP was $60,222, and the median income for a family was $60,999. Males had a median income of $39,323 versus $31,119 for females. The per capita income for the CDP was $20,029. About 4.5% of families and 5.7% of the population were below the poverty line, including 7.5% of those under age 18 and 8.9% of those age 65 or over. The Harris County Sheriff's Office serves the Harris County side. It operates the Mission Bend Storefront in an unincorporated area in the International District adjacent to the CDP. Metropolitan Transit Authority of Harris County, Texas (METRO) operates public bus services in the area. The agency operates the Mission Bend Park and Ride in an unincorporated area of Harris County, near Mission Bend. Mission Bend CDP residents in Fort Bend County are zoned to schools in the Fort Bend Independent School District. Mission Bend CDP residents in Harris County are zoned to schools in the Alief Independent School District. The Fort Bend County section is within the West Division, controlling school board slots 1 through 3. As of 2008 the board members in the slots are Susan Hohnbaum, Sonal Buchar, and Bob Broxson, respectively. Elementary schools serving the FBISD section of the Mission Bend CDP and within the Mission Bend CDP include Mission Bend, Mission Glen, and Mission West. Arizona Fleming, located in the Four Corners CDP, serves a section of the Mission Bend CDP. Hodges Bend Middle School, located in the Four Corners CDP, serves almost all of the FBISD portion of the CDP, while Crockett Middle School, outside of the Mission Bend CDP, serves a small portion. George Bush High School, located in the Mission Bend CDP, serves the FBISD section of the Mission Bend CDP. Alief schools that serve Harris County areas in the Mission Bend CDP include Petrosky Elementary School (in the CDP), Miller Intermediate School (outside of the CDP) for non-bilingual and bilingual students, and Albright Middle School (inside the CDP). Elementary school bilingual students are zoned to Rees Elementary School. Alief ISD students are randomly assigned to either Elsik, Hastings, or Taylor high schools. None of the high schools are within the Mission Bend CDP. The district also maintains two magnet schools, Kerr High School and Alief Early College High School. Mission Bend Christian Academy is located north of the CDP. Fort Bend County owns and operates the Mission West Park in Mission Bend. The park includes a baseball blacktop, a play area, tables, a walking track, and a volleyball court. ^ a b "Profile of General Population and Housing Characteristics: 2010 Demographic Profile Data (DP-1): Mission Bend CDP, Texas". U.S. Census Bureau, American Factfinder. Retrieved June 28, 2012. ^ Rodriguez, Lori. "Census tracks rapid growth of suburbia." Houston Chronicle. Sunday March 10, 1991. Section A, Page 1. ^ "Geographic Identifiers: 2010 Demographic Profile Data (G001): Mission Bend CDP, Texas". U.S. Census Bureau, American Factfinder. Retrieved June 28, 2012. 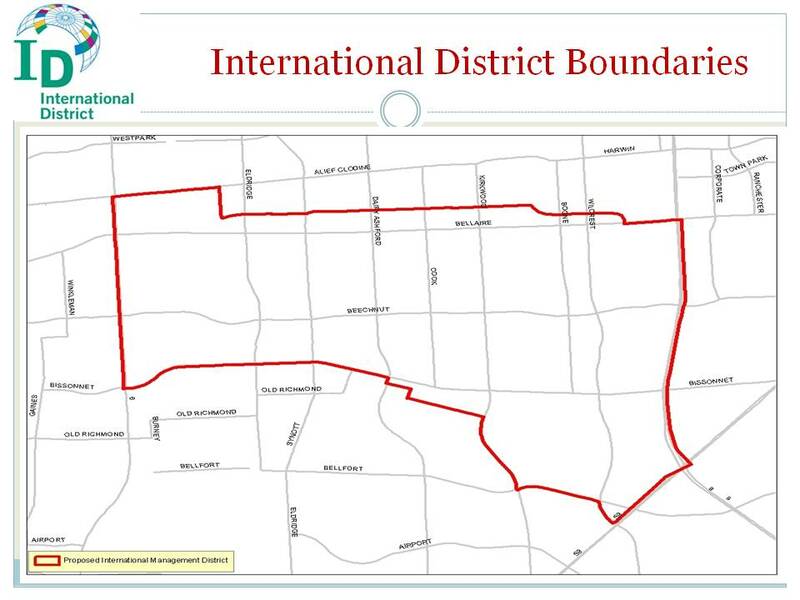 ^ "International District Boundaries Archived 2011-07-26 at the Wayback Machine." International Management District. Retrieved on May 2, 2010. ^ "Contact Information Archived 2010-03-03 at the Wayback Machine." Harris County Sheriff's Office. Retrieved on May 28, 2010. ^ "Mission Bend Park and Ride." Metropolitan Transit Authority of Harris County, Texas. Retrieved on January 24, 2010. ^ "Mission Bend CDP, TX" (PDF). U.S. Census Bureau. Retrieved 2019-04-05. ^ "2007-2008 Operating Procedures Archived 2008-12-09 at the Wayback Machine." Fort Bend Independent School District. Retrieved on December 8, 2008. ^ "Contacting Your School Board Members Archived 2008-12-04 at the Wayback Machine." Fort Bend Independent School District. Retrieved on December 8, 2008. ^ 2009-2010 Elementary School Boundary Archived 2010-01-03 at the Wayback Machine. Fort Bend Independent School District. Retrieved on August 30, 2009. ^ 2009-2010 Middle School Boundary Archived 2010-01-03 at the Wayback Machine. Fort Bend Independent School District. Retrieved on August 30, 2009. ^ 2008-2009 High School Boundary Archived 2010-01-03 at the Wayback Machine. Fort Bend Independent School District. Retrieved on August 30, 2009. ^ Home Page. Mission Bend Christian Academy. Retrieved on September 5, 2009. ^ "County Owned Parks." Fort Bend County. Retrieved on October 11, 2009.